I’m going through a Malaysian food phase at the moment. 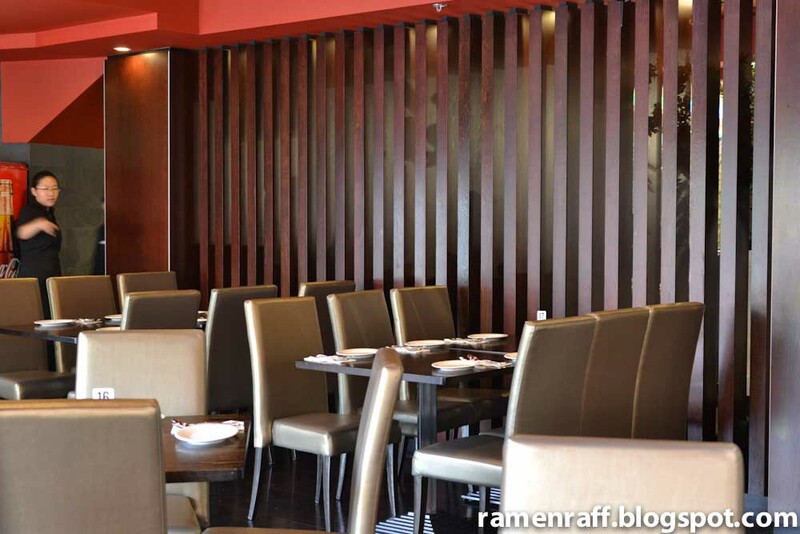 It is so easy to get hooked on Malaysian food. Besides the amazing combination of flavours the dishes has to offer, each and every dish tells a story of Malaysia’s rich culinary history and people. The varieties of dishes come from its diverse and multi-ethnic population of Malay, Chinese, Indian, Eurasian, and Nyonya. 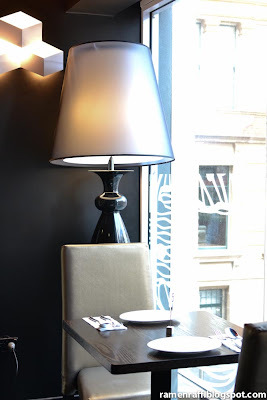 I was so excited to hear that another Malaysian restaurant has opened in Sydney called Nonya. 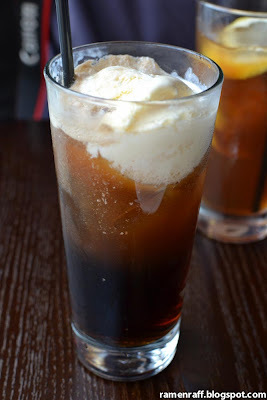 Then I started throwing fist pumps in the air when I heard about their promotion that up to the 26th of January 2012, their mains are priced up to only $5! I do love a bargain! Nonya is located near the heart of Haymarket/Chinatown, corner of Dixon Street and Goulburn Street. This contemporary looking restaurant is located on the second level of 1 Dixon Street. 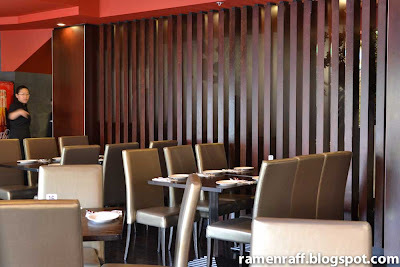 Simon (The Heart of Food) and I made plans to venture out to Nonya and check out the food. 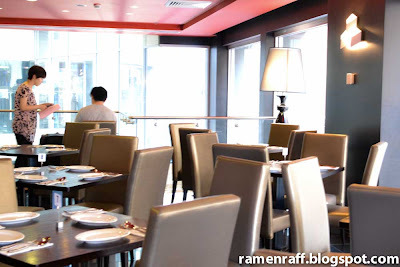 When we were finally seated, we also noticed that the staff were very friendly and polite. The game plan was, to order “a lot”! Please note that due the “everything is $5” promotion, servings are smaller than the actual full priced servings. 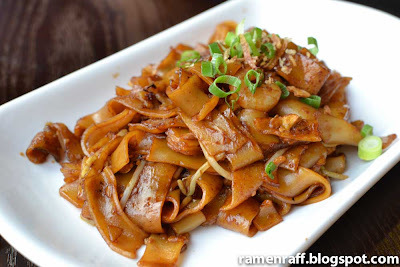 The popular flat rice noodle dish char kway teow (CKT) (Normally $11) was first served. It was over all, good. It had all the flavours of that you would expect from a CKT. The breath of a wok’s essence is present, giving the CKT a slightly sweet and slightly caramelised soy taste. The usual ingredients like slices of Chinese sausages, prawns, been sprouts and shallots are included. It was not as spicy as I expected (and wanted it to be) but nevertheless, I still enjoyed every bite of it. 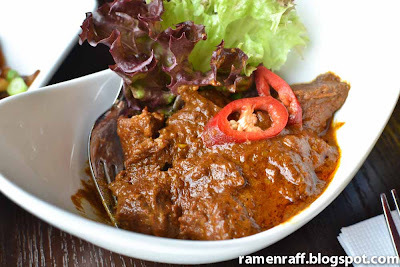 The beef rendang (Normally $11) was our favourite dish of the night. I don’t know how else I can explain this delicious and rich tasting dry caramelised curry type dish. But amongst all the rendang I’ve had, this by far is superior. The beef was tender and the sauce’s mind-blowing flavours were making my mouth jump for joy. 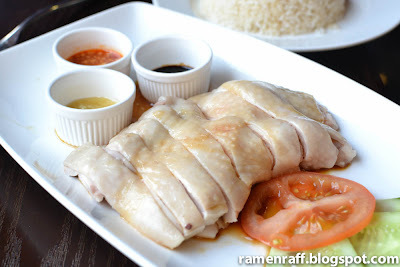 The Hainan chicken (Normally $10) was perfectly cooked and has a clean taste. The side sauces are so good and they definitely got the chicken party started. 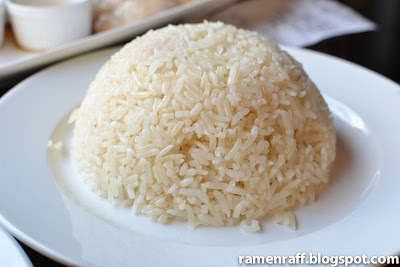 The rice, which was cooked in chicken stock, was rich in flavour. 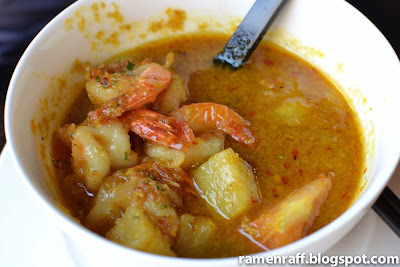 We cannot ignore the Assam Prawns ($11). I was so glad we ordered it. The Assam sauce was rich in tamarind flavour but sweeter than what I’m used to. Nonetheless, it was an awesome Assam dish. The prawns were perfectly cooked. The pineapple pieces brought balance to everything in the dish. This was the first time I had bakuteh ($12). Simon mentioned that it should have a clean porky and herbal taste. After my first taste of the broth, I have noticed the flavours of star anise and cinnamon. 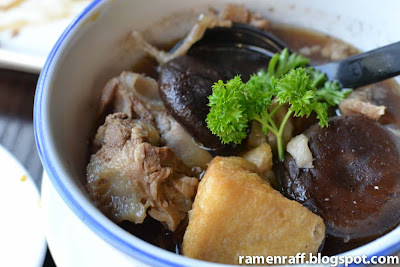 It has tender pork pieces with soft bone, mushrooms and fried tofu puff. I must also mention that this is an acquired taste type dish. I would certainly return and try all the other dishes. I certain got hooked on their mouth-watering food and especially their beef rendang. Our dinner at Nonya was very yummy for our tummies! How’s yours? 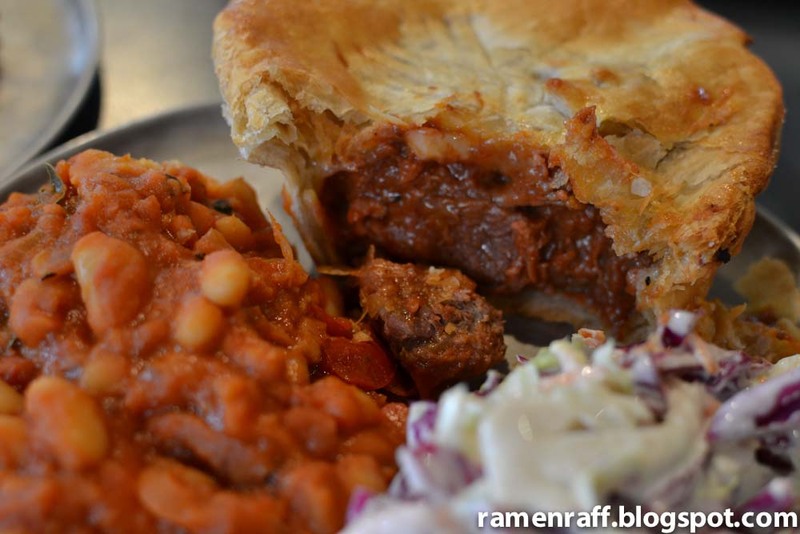 When I think about an All-Australian favourite food, meat pie comes to mind! 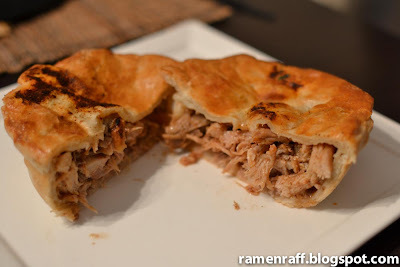 I love meat pies but the quality of both pastry and filling are very important. Kind of like good spaghetti Bolognese that has pasta cooked al denté and a tomato sauce that just blows your mind away. 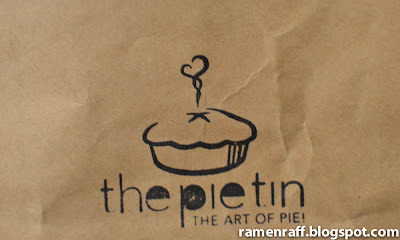 The savoury and sweet pies at Pie Tin blew my mind and body away! I have heard a lot of good things about this place. An invite from Chocolatesuze gave me that needed push to visit this place. Pie Tin is located in a backstreet called Brown Street near the busy King Street in Newtown. I was digging the very laid back and rustic vibe in this place. I decided to order a savoury pie and the sound of tender steak, smokey bacon and cheddar cheese pie ($5.80 a slice) tickled my fancy. It tastes as good as it sounds. It had perfect flaky pastry on top with a perfect base. The chunks of steak are very tender indeed. The sauce, bacon and cheese are an awesome combo with the steak. For $10, you can add two sides with your pie. I chose the Boston beans and coleslaw. 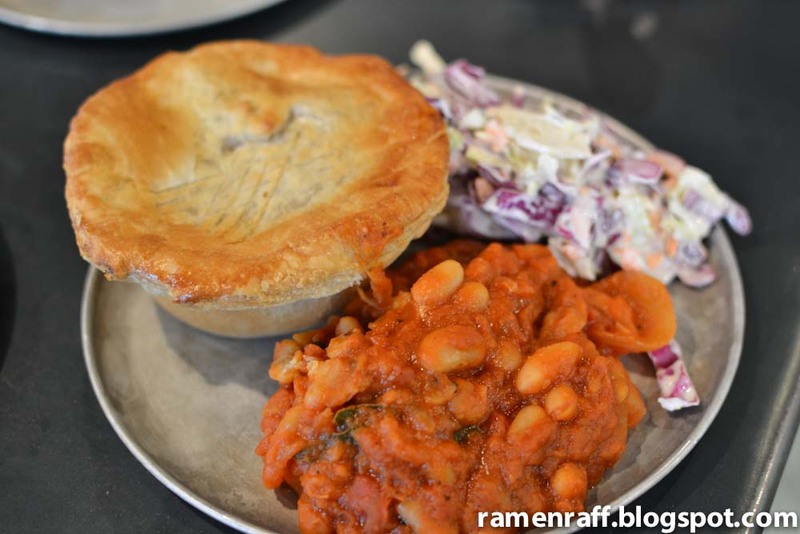 The Boston baked beans were so good and the coleslaw is not sour but rich in mayo creaminess. 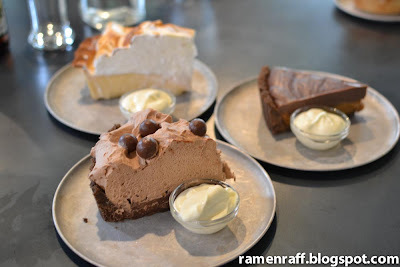 Chocolatesuze decided to order sweet pies and share them with everyone. “They were all amazing!” says my tastebuds. 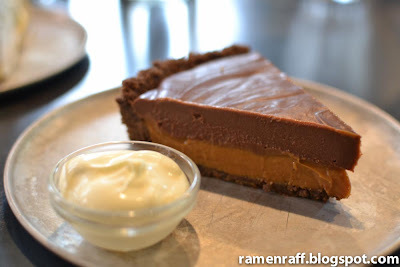 But, it was the very sweet milk chocolate ganache and caramel pie ($6.50 a slice) that stood out for me. This is something for people with really sweet tooth (like myself). 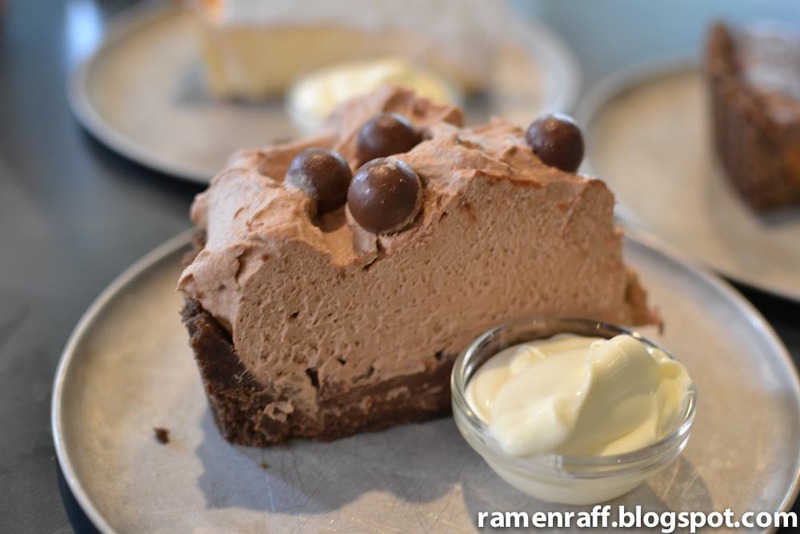 Besides from being the sweetest out of all three pies, it had a fudgy and smooth texture with rich milk chocolaty taste. The caramel literally takes it to another level of sweetness and lusciousness. 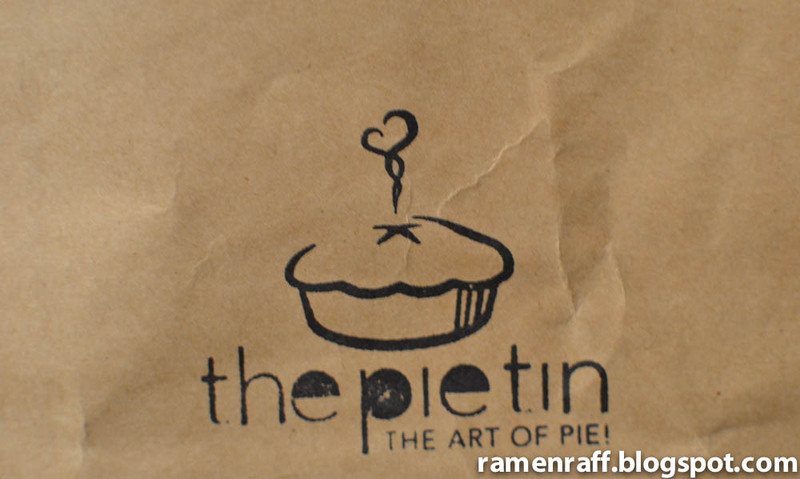 I wanted to enjoy Pie Tin’s amazing pies with Mrs Ramen Raff. 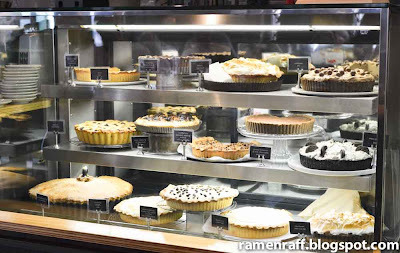 So, I decided to order takeaway, which included the southern slow cooked pork pie and Oreo pie. The slow cooked pork pie with apple and barbecue sauce ($5.80 a slice) is one awesome pie! The slow roasted pulled pork filling is so tender. It tasted like roast suckling pig and even more so, like the Philippine version of roast suckling pig. It is definitely very smokey and very flavoursome. 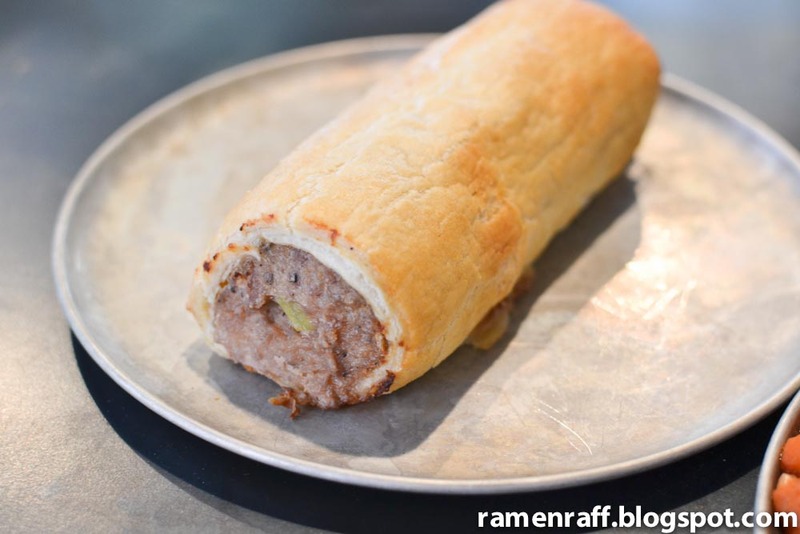 The slightly sweet apple and barbecue sauce completes the awesomeness of the filling. 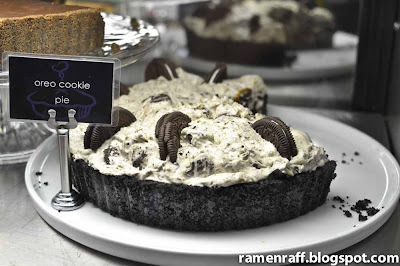 Last but not the least, the oreo pie ($6.50 a slice). 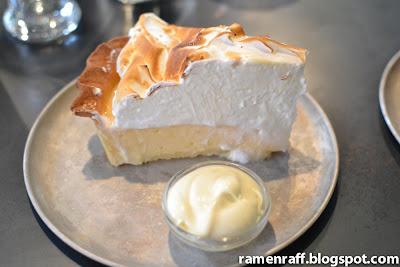 This is one pie I couldn’t get off my head! 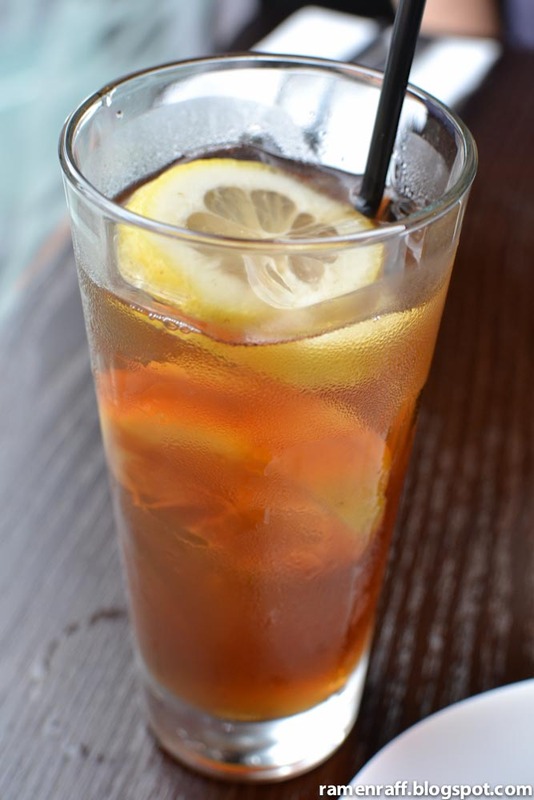 Its awesome taste just sticks with you and makes you crave for more. It is topped with oreo cookies. This is the best cookies and cream dessert that I’ve ever had. 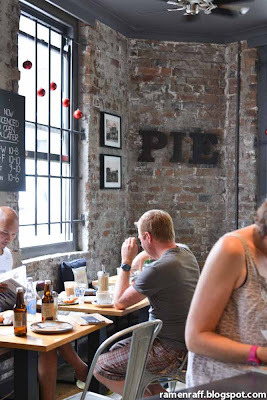 I see myself visiting Pie Tin very soon to try all their other savoury pies. They surely have one of the best meat pies and dessert pies I’ve had. My lunch at Pie Tin was very yummy for my tummy. How’s yours?